View More In Mountaineering Boots. The Crow GTX is a versatile summer mountaineering boot with an abrasion-resistant fabric upper and waterproof GORE-TEX protection. Designed for mixed summer use on general alpine terrain and alpine trekking, the Crow GTX has a crampon-compatible Vibram Mulaz sole – for semi-automatic crampons – that offers grip on rock and traction in mixed mountain terrain and snow. The GORE-TEX Performance Comfort lining delivers optimized climate comfort should the weather close in on you and there’s a full rubber rand for protection against rock and scree. The Crow GTX integrates patented SALEWA technologies to offer the Alpine Fit 100% blister free guarantee: 3F System for firm ankle and heel support, Climbing system to ensure that it fits perfectly around your foot and Anatomical Cuff for comfort during descents. GORE-TEX PERFORMANCE COMFORT LINING: Breathable Gore-Tex liner allows your feet to stay comfortable in changing weather conditions. VIBRAM MULAZ SOLE: A stiff midsole and crampon compatible construction offer optimal traction and surefootedness on mixed terrain. LEATHER UPPER & FULL RUBBER RAND: 1.6mm suede leather with abrasion resistant fabric upper. 360° full rubber rand. ADJUSTABLE FOOTBEDS: MFF+ interchangeable footbeds adjust to the shape of your foot. IDEAL USES: Mountaineering, Alpine Climbing, Alpine Trekking, Glacier Travel. WEIGHT: 20.1oz./570g. 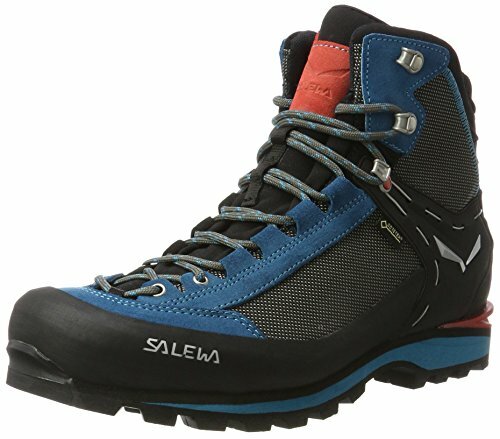 If you have any questions about this product by Salewa, contact us by completing and submitting the form below. If you are looking for a specif part number, please include it with your message.